Have you ever seen an old western movie with a customer shopping in the town store, and the customer gets to the register and says “Put it on my account?” They didn’t use debit cards or credit cards, but they were probably customers with good credit and a store credit account. 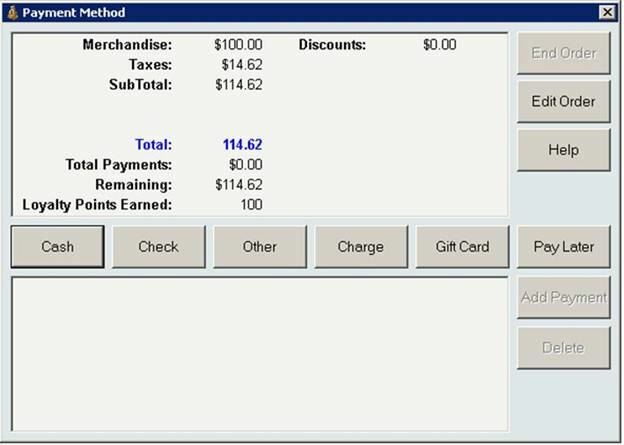 If you extend credit to your customers, you can bring a piece of that old world charm to your store with InOrder’s Point of Sale module. Simply use the “Pay Later” option, and the receipt prints. For returns, this feature sends the balance to A/R as a credit. InOrder tracks the customer’s credit limit for you and only allows this for customers with good credit and enough unused amount on their credit limit to cover the order total. InOrder also makes sure your customer service rep has the appropriate privilege to access this feature. 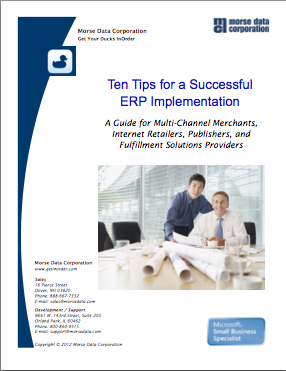 With this feature, you get old world charm and customer service with the latest ERP technology. While you might expect ERP systems to backorder or cancel an out of stock item, InOrder can see stock available at a nearby location. If that stock can be brought to the warehouse in time to fill the line item, it is allocated to the order. To do this, InOrder generates an inventory transfer to transfer the stock from the remote location back to the warehouse from where the order shipment needs to ship. Personnel at the remote location print the “transfer out” order and pull the stock as soon as possible. The stock is transferred, and the transfer is posted. Stock can be pulled from any designated facility that may have the stock on hand, such as a remote storage location, a point of sale store or merchandise exhibit, or even a consignment location. In some cases there is a risk that the stock is sold to a point of sale customer before it can be transferred. Therefore, InOrder keeps the order from printing in the ship-from warehouse until the transfer is posted to confirm the stock was retrieved. The major carriers have recently announced billing changes effective January 2015 that use new DIM factors and will increase shipping costs on most packages shipped. To help more effectively estimate shipping rates, a new “DIM Factor” field is available on ship vias that compute shipping based on Weight Per Carton. 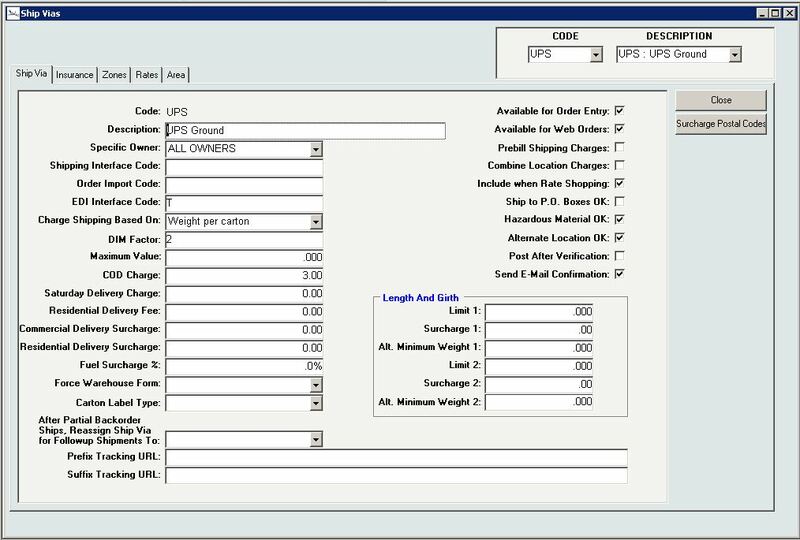 If this field is empty or set to 0, the old method of calculating shipping charges is used (simple calculation of merchandise weight + carton weight). When this field has a value >0, InOrder uses the item dimensions (height, weight, length) to determine appropriate cartons. InOrder calculates the carton’s dimensional weight and compares it to the merchandise weight, and the shipping charges are computed based off the greater of the merchandise weight and the dim weight. Then the shipping charges for each carton in the shipment are summed to calculate the estimated shipping charges for the shipment. One of the many great features about the InOrder ERP system is its versatility. For example, you can tell InOrder which default credit card to use when processing payments, or whether to pause before printing checks. You can even determine when to stop totaling orders for each added line item to improve response time of very large orders. These functions can be controlled with simple configuration settings that are accessed through an easy to use window from the main menu. 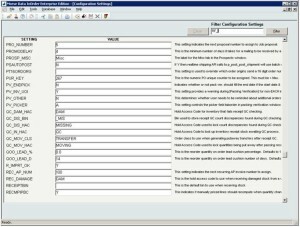 The InOrder ERP system can use hundreds of configuration settings, so the most efficient way to find your setting is to use the Configuration Setting Filter. Simply enter the setting you need to set, click the Filter button, and InOrder finds it for you. 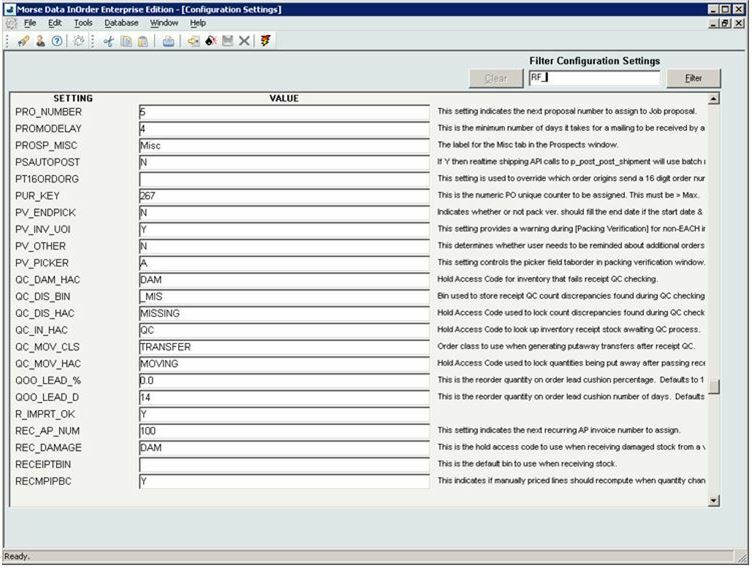 If you’re looking for a configuration setting but you don’t know the exact setting, the Filter can help you find it. For example, if you need to set the default maximum number of batches per shipment that can be assigned to one warehouse picker, you can search for a key word. InOrder will display all the results it finds with that word in the setting or the description. Simply click the Clear button to start a new search. This filter is also on the Security Class window to help you search on the Privileges tab.